In April this year, TJ13 reported Lewis Hamilton had ended the life long relationship he had with his helmet supplier, Arai. Hamilton explained, “As a driver you want to improve everywhere, and the [Arai] helmet’s not been in the wind tunnel”. The tiniest margins in Formula One matter. In 2015, Nico Rosberg lost out on pole position to Hamilton in China by 4/100ths of a second. Shanghai is a circuit where Hamilton has dominated qualifying in recent years. And it appears Hamilton’s switch of helmet supplier was not without good reason. Open cockpit racing has always meant the drivers can feel the effect of the wind buffeting the head as they hurtle down the straights and through the high speed corners. So now as with all other aspects of the car design – which pass under the aerodynamic microscope – the driver is being scrutinised for his impact on the car’s aerodynamics. Michael Schumacher pioneered certain investigations into helmet design and aerodynamics and Sebastian Vettel has taken up the mantle. 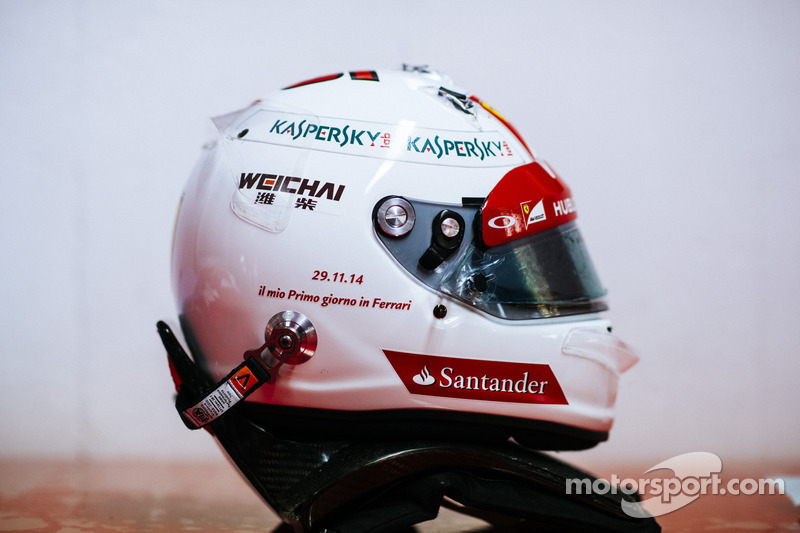 A close examination of Vettel’s Helmet reveals a small ‘front wing’ kind of arrangement. This is designed to produce downforce as does a wind on a car – and prevent the airflow over the car lifting the drivers head at high speed. Also at the rear of Vettel’s helmet is a scoop designed to smooth the airflow behind the drivers head and attach it to the main flow of air without creating any turbulence. What make of helmet does Vettel use? And is there any articles out there re: comparison between different manufacturers designs, and the interaction between the driver’s aero and that of the car? Arai ! Or at least he did at his first race for Ferrari. His paint jobs are done by Jens Munser and this is from his site. One of the important items though is constant head position. I don’t know if anyone here has noticed the trend in bicycle aero helmets, but they have become much less extreme. sure the long tails helped aerodynamically, but only when the rider’s head was in a perfect position. When the head dipped, it caused an excessive amount of drag, and it is impossible to maintain a perfect position for an hour or more. This is why the tails have been stubbed. It may be that certain helmet features help when the driver is perfectly positioned, but it may cause harm when the driver is getting slammed while cornering. The f1 drivers head is more or less always in the same position. They do not have the same room as someone on a bike. There’s a small concealed appendage connected to these helmets. It’s designed to scoop up money for the enclosed head. Thank u Sebastian, Michael and i are proud of you.